Diabetes no doubt is an issue of habit change. It is an issue of modern life style; it is obviously an issue of modern dietary pattern, and I dare say a major health issue resulting from contemporary western dietary orientation. In the days of our fore fathers such health complications were never heard of. That was so because then the folks were truly people of the earth. They were very close to nature and depended on it for everything they had or did.This is very much unlike what obtains today especially in our urban settings. Today modern civilization has caught up with everybody and the ever bustling urban life and the style that accompanies it has not helped in the least. The frenzy and busy nature of urban life has worked greatly against the populace. This is because the rate of development and the need to stay abreast of the action has dramatically turned things around for the negative. Thus everybody is in a hurry. Stress builds in, vehicular accidents are on the rise; and there are more inventions yet to make the urban life even move faster. But this same bug has also caught up with the so called rural settings, and so no one is spared! What am I driving at? All of these have given rise to the necessary evil we call fast food today. 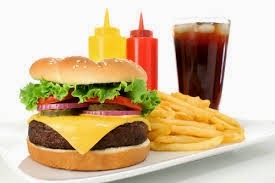 The fast food joints and, or outlets have sprung up everywhere especially in the urban and city centres. These modrnisation factors and agents have brought about in their wake the boom and continuous surge in the fast-food industry with the attendant fizzy drinks most of which are artificially concocted. This I must let you know is the genesis of the attendant modern day health scourge called DIABETES. This ‘modern’ disease is also found to be a polygenic disease, and characterised by abnormally high glucose levels in the blood. It is in the class of any of several metabolic disorders marked by excessive urination and persistent thirst, etc. To curb this health menace therefore, you will be well advised to turn to healthy eating. This will usually involve the consumption of whole foods including grains. Also take plenty of fruits and vegetables, and lots of fish and less of (red) meat.